the different parts are really the template for growth that a lot of the fastest growing companies in the world follow. He also explains why "if you give up too soon, or if you don’t keep taking the steps, that’s the problem people face—or basically unfair self-criticism.You need to struggle. You can’t create something great without the struggle.It’s okay. Everyone goes through that." I will say, this book is not a culture book. This book is not a management book. It’snot even a sales book. It’s a growth book." 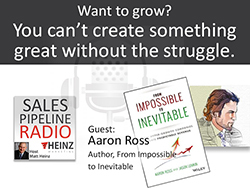 Listen to learn why Matt says he can’t recommend this book enough.From Impossible To Inevitable. You can learn more about the book right now at the website www.fromimpossible.com. You can pre-order a copy.There’s a great set of gifts available to those that download the book in advance. There’s a chance to get some free tickets to the SaaStr conference,there are some other awesome resources available online. So go to www.fromimpossible.com to check it out. Can Knuckle-Dragging Salespeople Still Succeed?